Ready to serve up some looks *and* libations. 1. A rustic serving cart that'll cause a *chain* reaction next time you have company over because it couldn't be any more perfect. Get it from The Home Depot for $102.50. 2. A worldly option fit for holding your wine collection that's nearly as well-travelled as you. Get it from Amazon for $79.99+ (available in two color combos). Also available in a larger size. 3. 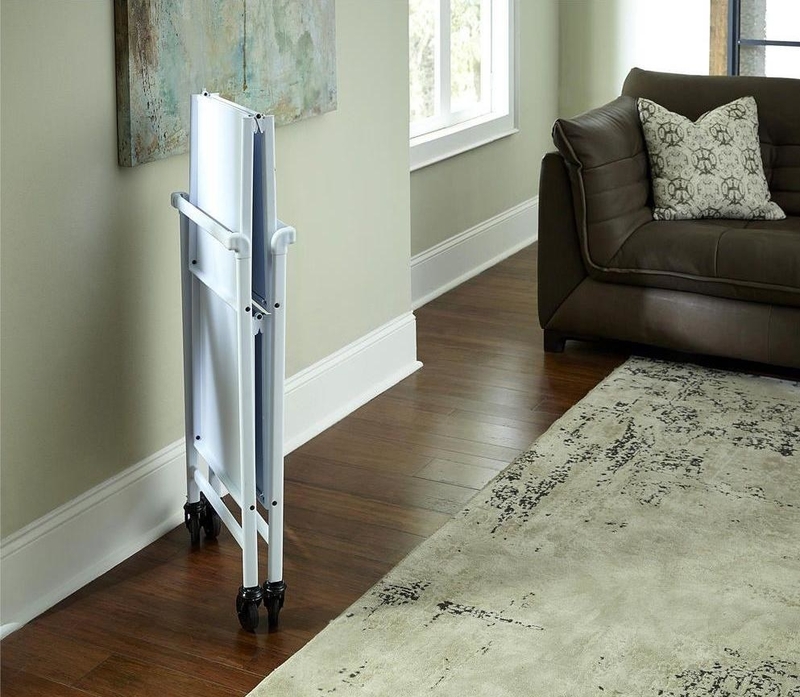 A no-frills folding model as a huge helper when push comes to shove in the closet. Holds up to 75 lbs. on each shelf and folds up to less than 6" flat for storage. Get it from The Home Depot for $56.45+ (available in three colors). 4. An open industrial concept that'll satisfy your appetite for something with hairpin legs and locking casters. Get it from Amazon for $149+ (available with expert assembly). 5. A walnut and chrome looker you may make an extra lap in your den every so often just to admire. Has a weight limit of 11 lbs. Get it from Amazon for $95.25. 6. A rose gold Art Deco beaut to prove that even a cocktail at home can be incredibly glamorous. Get it from The Home Depot for $249.92. 7. A wicker beaut to serve up hours of poolside drinks thanks to an ice bucket down below. Get it from Amazon for $185.99+ (available in two colors). 8. A clearly good idea as a way to elevate a room you haven't refreshed in a while. Get it from The Home Depot for $166.95. 9. A tiered number with plenty of surface area and a towel rack that'll double as a push handle when the party relocates to another room. Get it from Wayfair for $115.99 (also available in white). 10. A versatile cart with a tray you can pick up and take with you. And there are even spots for your stemware. Get it from The Home Depot for $337.92 (available in three color combos). 11. A glam style where X marks the spot for a treasure trove of cocktail-mixing inspo. Get it from The Home Depot for $179.99. 12. A mid-century modern look — it might just convince you to buy a house with a sunken living room. Get it from Target for $157.99+ (available in three colors). 13. A hammered finish to help you ~line up~ your go-to libations. Get it from The Home Depot for $109.69. And check out a similar, bigger design in gold. 14. A metallic intersection of your fave bookcase design and your fave beverages that'll look so elegant. 15. A multi-tasking wine cart to hold all sorts of tools, bottles, and glasses. So really it's like having a butler for drastically cheaper. Has a 6-wine bottle capacity, 1 closed shelf, and 3 open shelves with rails. Get it from The Home Depot for $170.99. 16. An outdoor tea cart that'd look so charming in your sun room 'til it's warm enough to roll it back outside on the patio. Get it from World Market for $229.99 (also available in graywash). 17. An industrial-style option with three gracious tiers and a bronze finish as a perfect pairing to go with your favorite whiskey ;). Get it from The Home Depot for $154.49. 18. A compact, glitzy model for an entertaining addition that'll be as good as rose gold. Get it from The Home Depot for $159.95+ (available in three finishes). 19. 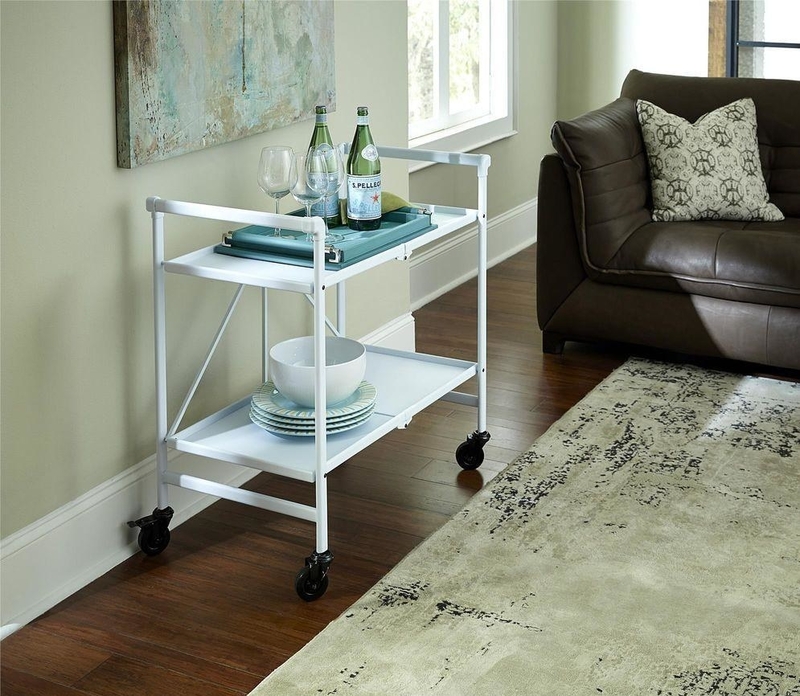 A standout cart that may just throw that bookshelf you've been using as a bar for a loop. Get it from The Home Depot for $219 (also available in white). 20. Or a luxe look in case you can't just stick with one shape. Get it from Amazon for $157.47+ (available with expert assembly). 21. A dashing bar cart that'll be the perfect size to use as an end table on the reg if you please! 22. A storage-heavy cart to basically serve as two lovely looking baskets welded together, so it can handle your heavy hitters like buckets of sparkling water and big box-store jars of pretzel bites. Get it from The Home Depot for $147.47. 23. A multi-level marvel to help you graduate to a ~legit~ home bar situation. Get it from Amazon for $119.15+ (available with expert assembly). 24. A cage-y option that may interest you if you've ever had a bottle of nice spirits slide off a cart with open sides. Get it from The Home Depot for $163.53. 25. A hefty cart sure to fit all your stemware. And if that's not the case, maybe you should purge some glasses. JK, just pick up two of these bad boys! Metal racks hold 12–15 wine glasses and 10 bottles of wine. Get it from The Home Depot for $146.16. 26. A glimmer of hope for storing all your bar things people keep giving you in Secret Santa gift exchanges because you said you liked whiskey like five years ago. Get it from Amazon for $193.80+ (available with expert assembly). 27. A buffet-style cart with its own sliding barn doors to give you all the Fixer Upper vibes. You know what that far wall could use? Some shiplap. Get it from The Home Depot for $999.